IHC's Temporary Medical Plan . . .
Short-Term Medical is offered to members, their spouses under 65 and eligible dependents under age 26 who have a social security number and can answer 'no' to the health questions on the application. Child-only coverage is available for ages 2 through 18. Flexible and affordable coverage options for 1-3 months. STM is not available in all states. Some states only allow a maximum six-month coverage period. $2,000,000 lifetime maximum per covered person. Pivot Health Short Term Medical is designed to provide great short-term coverage with benefit options equivalent to long-term coverage. 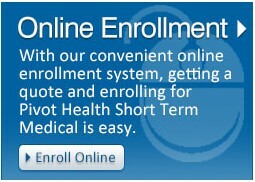 Get a free, no obligation quote or enroll today to receive coverage effective as soon as 12:01 a.m. tomorrow! ​Any amount of time without health insurance is too long. Our Short Term Medical insurance includes flexible plan designs and options to help you find the plan that fits your needs, budget, and in this case, your time frame.